I was working in the lab late one night and decided to pack this eerie sight! Since Halloween is approaching soon, my fellow bento bloggers and I are having a frightful fall blog hop! I created this Frankenstein bento for today's lunch. Make sure to scroll down to see what my bento friend Grace over at Eats Amazing came up with. Main compartment - A freehand cut Frankenstein head with red hair in this version! Hair, mouth, scars, and pupils are free hand cut from fruit leather. Eyes are provolone cheese and black olive iris. A couple of picks. Lower left - Another creature carved into part of a green apple above seedless black grapes. Upper left - Fruit leather face on pistachio pudding. Upper right - Organic baby carrots with a spider cupcake ring. I also included a Lunchbox love note from the new joke edition. LOL! Where do monsters swim? Answer: In Lake Eerie!! This bento is packed in our Planetbox Rover. Click to check out the next one from Grace over at Eats Amazing or click on the image below. Keep celebrating by hopping through the rest of the Blog Hop. Awesome! I love all the details! Love your Frankenstein!! So cool! So fun and creative!! Your apple is fantastic, and that sandwich is awesome! That Frankenstein sandwich is brilliant! I am always a fan of your work! From your Frankenstein sandwich to the face on the pudding - fantastic details, awesome lunch! 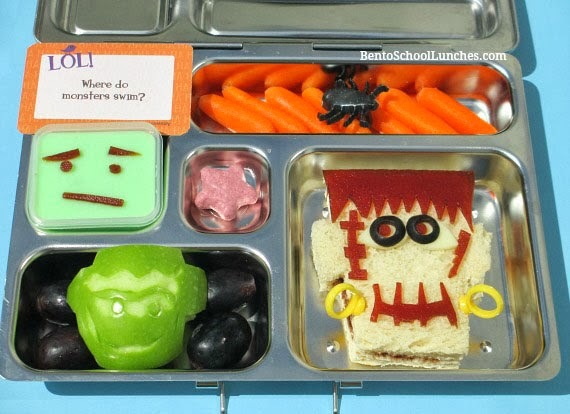 Love your Frankenstein sandwich and the monster pistachio pudding! the fruit leather is genius! This is great! I love the Frankenstein theme! the fruit leather pudding face is my favorite! How cute is this. Everything is soooo cute! This looks so good! Loved the Frankentstein sandwich! Great use of the ring picks on Frankenstein. Frankenstein is so cool! Awesome job! The fruit leather face is awesome! Love your Frankies - so cute! Love the pudding. So cute! Very cool! Love the Frankenstein! I love the Frankie! so nicely done! SO MANY fun details! Great lunch, Rina!